Product prices and availability are accurate as of 2019-04-15 05:28:00 EDT and are subject to change. Any price and availability information displayed on http://www.amazon.com/ at the time of purchase will apply to the purchase of this product. The Double Feature PV-VD4743S integrates a high-quality, progressive-scan DVD player and four-head, hi-fi VCR into a slim, affordable, and handsomely designed package. Format compatibility extends from DVDs, videocassettes, and CDs to recordable audio CDs and DVD-R video discs. Whether your living room is currently home to an HDTV or you're merely thinking of "someday," the PV-VD4743S stands ready to deliver the full potential of DVDs. Progressive scanning, referred to as 480p for the number of horizontal lines that compose the video image, creates a picture using twice the scan lines of a conventional DVD picture, providing higher resolution and sharper images while eliminating nearly all motion artifacts. 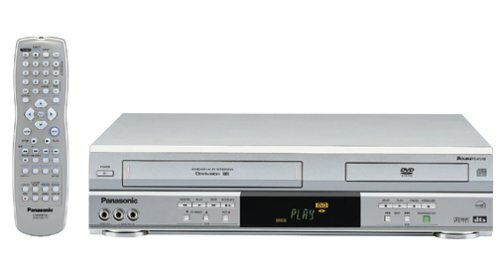 The VCR's four-head design ensures smooth slow-motion tape play (forward and reverse) and clear still-frame images, and with hi-fi sound the unit records and plays back stereo audio tracks. The unit even lets you record a TV show while watching a DVD at the same time. A set of left/right analog-audio outputs channel audio to Dolby Pro Logic receivers and stereo televisions. Both Dolby Digital and DTS 5.1-channel surround-sound signals can be routed through the player's optical digital-audio output for direct connection to a full-featured audio/video receiver.